← Man Sees Light Above Car. Believes He Was Abducted. Glowing Object Changing Colors Found in Contrails Photos. 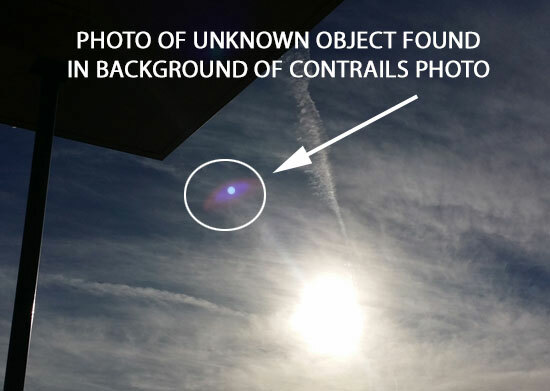 PHOTO OF UNKNOWN OBJECT FOUND IN BACKGROUND OF CONTRAILS PHOTO. Description: My daughter took these pictures on 2/5/2016. The location is Great Falls, MT. Maelstrom AFB is nearby and we see lots of contrails. She was at a local park with her 6 year old son and she told me that on this particular afternoon there were more contrails than usual and their pattern was different than normal. The sky was very active she said. So she took her cell phone, a Samsung Galaxy Note 3, and snapped 5 pictures of the sky and contrails. The whole procedure took maybe a minute or two. The sky was too bright to see her pictures as she took them. She just aimed at some of the contrails. Later, upon studying her pictures, she found this object apparently flying across the sky. In the last picture the object appears to be changing colors and glowing or reflecting light differently than in the earlier pictures. Judging by it’s position in each picture, it was moving across the sky much faster than the jets. It moved from southwest of her, to more westerly and then southeasterly. She did not see this in the sky. She just saw a lot of jet contrails, including one moving straight up. I was almost as if they were searching for something she said. In the first picture there is nothing, then the object is at 2 o’clock to the sun, then 3 o’clock to the sun, and then 11 o’clock to the sun. That is the sequence of the pictures. MUFON Field Investigator Notes: MUFON concluded that the object in the above photo was a lens flare. I agree. This entry was posted in Montana UFO Sightings 2016, UFO Photos Montana. Bookmark the permalink.